The first sector I served in was in Las Nieves. 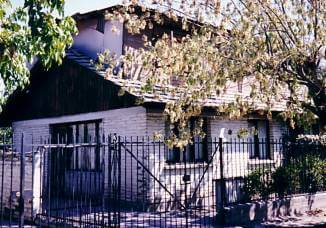 This area was situated around the area of Avenida Gabriela and Avenida La Florida in Puente Alto. We were right up against the beautiful Andes mountains. Notice the telephone poles were made from concrete. September 18th is Chilean Independence Day (notice the Chile flag hanging in the background). 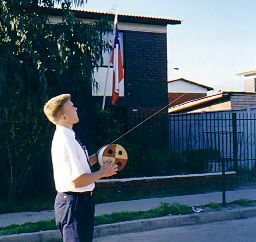 Chileans love to fly their kites, especially during this festive month. Here I am doing just that. Notice in the background how the houses have fences around them. This was very common. To get into a house you have to yell “halo” and the person would come to the door. Here I am with my trusty bike (which was eventually stolen) behind the El Peñon subdivision en Puente Alto. This was on the edge of an orchard. By the time I left Chile, this green area had all been turned into new duplexes. 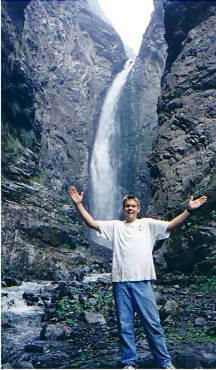 To the east of Puente Alto and up the canyon was the waterfall seen below. The was near Cajón del Maipo. We had to take a bus for a while and then hike up the canyon to get here. Below is a typical street in my area of Puente Alto. Usually, buses were going up and down the street, not horse-drawn carts. Every week there was a street market called a feria. They sold all kinds of food including fish. Here I am in one of their carts. Los Andes tower over a section of two-story duplexes in my area. They rise up on the east side of Puente Alto. 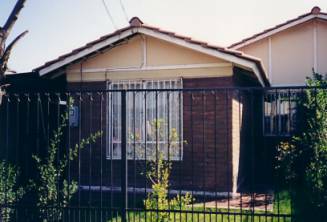 This is the house in which my companion and I lived in Puente Alto. We shared it with the Lepileo family, a young couple with a little boy named Enzo. They took really good care of us. One of the best places I lived during my entire mission. My second area was the Fernandez Albano ward in the community of San Ramon. 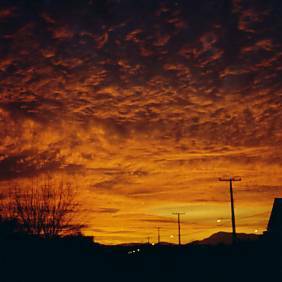 This was in the far northwest corner of the mission but in the south central part of Santiago. We lived upstairs in the back of the house below. We stayed about a month before we moved to another house. This was the two story chapel that we attended. After I left, the fence was doubled in height because people were breaking in and vandalizing it. 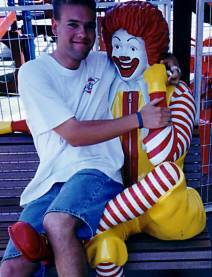 Here I am with Ronald McDonald. There was a McDonald’s a few minutes east of our area. When I first went to McDonald’s in Chile, my companions were so happy because there was lettuce on the Big Macs. Apparently, there had been fear of cholera before and so there was no lettuce. 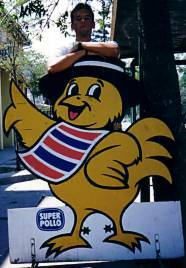 Super Pollo was a the name and logo of a Chilean poultry company. The chicken is wearing parts of a typical Chilean Huaso outfit. This is the second house we lived in. We lived upstairs and you could see out the cracks in the walls. Not too bad since it wasn’t Winter when I was there. This was the typical school bus. It was just a van that a private citizen would drive and charge parents for kids that wanted a ride. Since this was usually expensive, many children rode the cheaper micros to school. We four lived in the same house for about a month. Left to right: Elders Carroll, Wagner, Fletcher, & Me. My third sector was in the San Martin ward in San Bernardo. 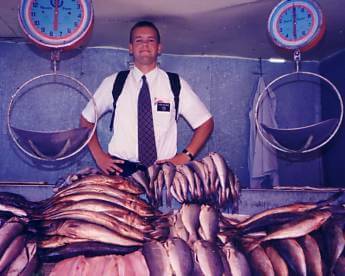 My companion was my “greenie”, or new missionary that I was training: Elder Milanés. Below I’m at the mission home picking him up. 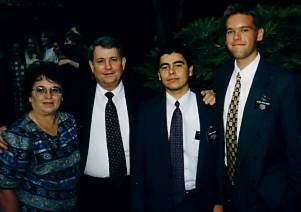 Left to right: Sister Hall, President Hall, Elder Milanés, Me. 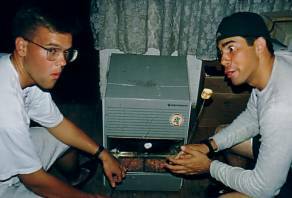 During the winter we would use a propane powered stove or estufa to keep warm. Here we are roasting marshmallows! It often rained all winter long. When it did rain, the streets would flood as there was no place for the water to go. My companion was from northern Chile where it is the driest desert in the world. 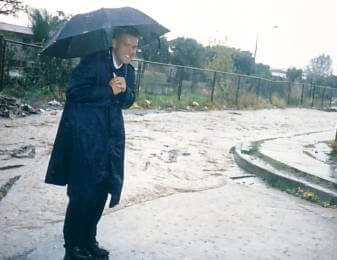 He had never seen so much rain in his entire life. On top of Cerro Chena overlooking San Bernardo and the Andes in the distance. All the smog in the atmosphere made for some spectacular sunsets. View of a typical neighborhood in this area of San Bernardo. My area had quite a diverse collection of wealthy housing and much poorer neighborhoods. This one is about in the middle of that spectrum. 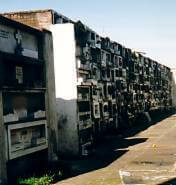 All the cemeteries that I saw were like this one: above ground. My understanding was the family of the deceased had to pay rent on the slot where someone was buried. If rent was not paid, the body was taken out and buried in a common grave. This could be avoided by paying a large sum of money up front in place of rent. 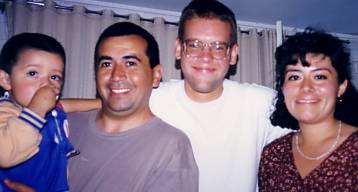 Here I am with the mamita that took care of us. 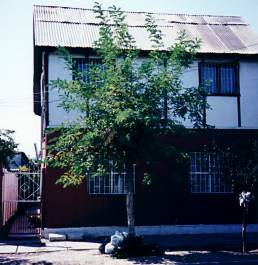 Four missionaries lived in this house that was attached to a little store that she ran. 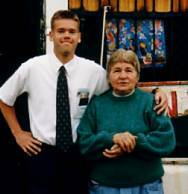 She had been taking care of missionaries for years and called us all “bebitos” or little babies. Since downtown Santiago was outside of my mission’s limits, I only got to visit once or twice a month on average. We might have gone downtown for a conference or to get some paperwork done for our visas. Easter Island is Chilean territory and one of its famous statues was displayed downtown. The graffiti says “Sold to the Yankees,” meaning to the United States. 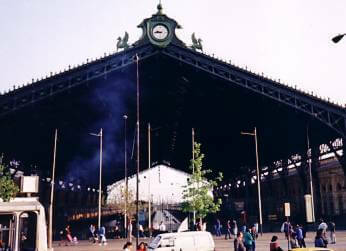 This is Central Station “Estacion Central” where trains would leave for southern Chile. When I was in Buin, we would sometimes take the train back home from downtown. View of downtown from Santa Lucia. The CTC tower (white building over my left shoulder) is the tallest building in Chile and was under construction when I first arrived in Santiago. 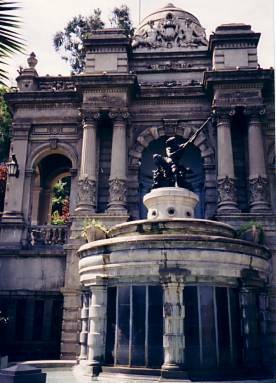 Below is a large monument at the base of Santa Lucia. Santa Lucia was the hill from which Santiago was founded and planned by Spanish explorer Pedro de Valdivia. This act is depicted on the 500 peso bill. 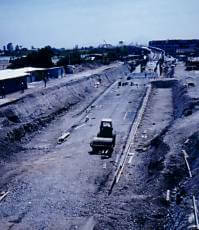 This is the Metro subway’s line 5 under construction. This isn’t really downtown but the end of the line that headed north to downtown. This line was finished and operational by the time I left Chile. Santiago has a very modern and efficient subway system. When we would have to catch the subway during rush hour it was like being packed into a can of sardines. I always had memorable experiences on the public transportation of Santiago.